Hello my dears! How long has it been since my last video? Too long! Here in Europe it’s still another long week until we can get our hands onto the new Animal Crossing game, so I thought I’d make a video to pass the time. 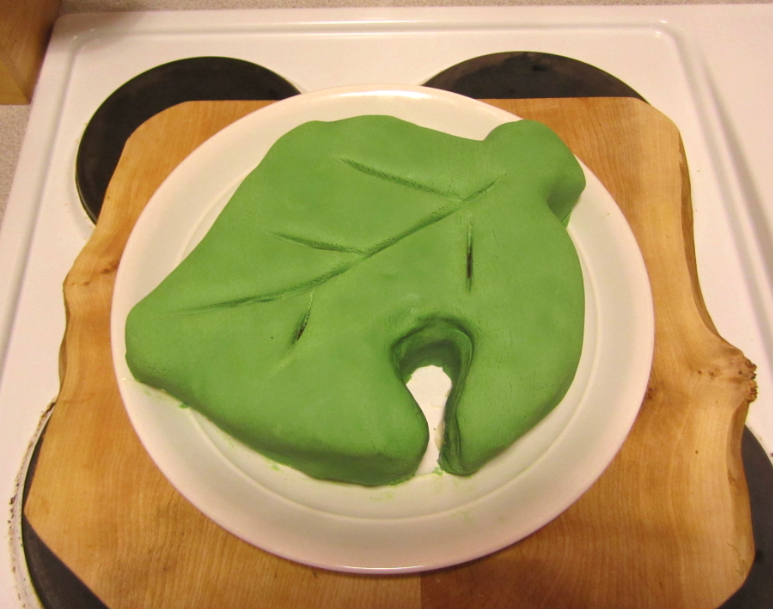 And what would be better than an AC inspired leaf cake? An AC inspired toffee leaf cake! The cake recipe I’m about to share with you is one of my favourites. It’s so easy to make, and so delicious. As you’ll see I use carnation caramel in my cake, which seems to pop up in my local supermarket at random intervals. I’m not sure how readily available this little tin of magic is, but fret not. Whenever I can’t find it, I simply get a tin of condensed milk, put its contents into an oven safe glass dish, and let it sit on a low to medium heat for about half an hour. Do check it quite often, as the condensed milk is prone to burning. If you’re unsure, simply cover the dish with some aluminium foil. You’ll know your oven best! When the milk is a lovely light golden brown colour, take it out of the oven, let it cool completely (believe me, you do not want to burn yourself on this stuff) and remove any burnt bits you might find. Give it a stir and voilà: Your very own dulce de leche. If you can’t find pre-coloured icing, you can get a white icing block and some green food colouring and make your own, like I’ve done in my previous recipes. Just be advised that it takes time and effort, usually makes a mess and is fiddly to work with. Since you’re adding extra liquid to the icing in the form of the food colouring, the icing will get softer. This means that you’ll have to store it in the fridge after dying it and rolling it out, so that it has time to firm up again. Work quickly and neatly, and you’ll be totally fine. 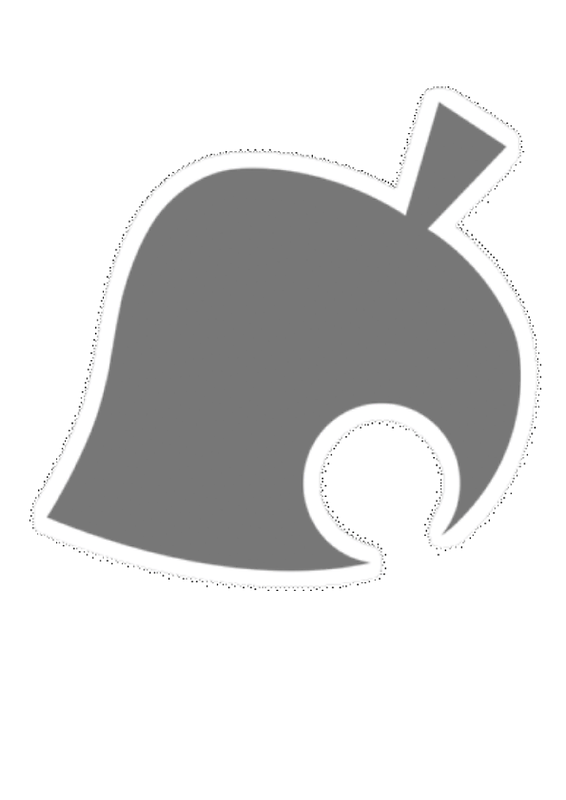 You can get the leaf template I used here. For reference, my cake tin is 8 inches in diameter and about 3.5 inches deep, and it works perfectly with the leaf I’ve included. If you have a smaller cake tin, simply re-size the image. And now without further ado, here it is in all its glory: My delicious toffee cake recipe! Combine the flour and sugar in a bowl. Add the eggs and the caramel, melt the butter and add it in small amounts while stirring constantly until everything is combined. Transfer to cake tin, sprinkle on the fudge pieces and bake in the oven for about 45 minutes (or until knife comes out clear) on a medium heat. Cool, trim, coat and put on the icing. Watch the video for instructions, and do get in touch if you have any questions, as silly as you think they might be! And finally, have a look at these great links for inspiration and information. If this is your first time baking a cake, have a look at my cake baking strategy guide. It contains useful tips and tricks for first-time bakers. For some more information on dulce de leche and alternative ways to make it at home, check out this blog! And finally, if you’re not yet excited about the latest Animal Crossing, have a look at the official website. I can’t wait! You are only a few ingredients away from making a lovely Italian inspired dish. What better incentive to get started? Sometimes, I forget how much I love a certain food until I eventually eat it again. This especially happens with green beans. Whenever my mum made it, I used to wolf down half the bowl myself, but for some reason I never really cooked with them myself. Well, that’s about to change cause it turns out that I really love green beans! But something I love even more than green beans is umami. I’d happily swear to never ever eat sweets again, as long as I have a moderately (un)healthy supply of all things savoury. Hard cheeses and cured meats are only some of the foods naturally rich in umami and they both feature in today’s recipe. Throw in a good dose of garlic and I’m in heaven! Did you know that umami can be found in breast milk? We’re basically raised on it! And next time you find yourself craving some miso soup, remember that umami is a big part of Japanese cuisine. If you’re not a big fan of pesto, don’t fret – there are many other things you could stuff your chicken with. How about some plain soft cheese with a bit of lemon juice, chives and crushed black peppercorns? Or if you’re looking for something more robust get yourself a pesto made with sun-dried tomatoes. Same great umami flavour, without the mountains of basil. If you’re looking to save some pennies, you can opt for a simple prosciutto instead of the real deal Parma ham, although I often find that it’s better value to get the latter. And if you’re cooking for two, there’s always a couple of slices left over that you can eat out of the packet when no-one’s looking… after having washed your hands thoroughly, of course. Oh and don’t worry If some of the filling spills out – just serve it on the side with the chicken. If you really don’t want to make a mess, you can cook the chicken in little parcels made out of baking paper – simply put the chicken on the paper, fold it over, and then fold the edges together. That way, there will be no spillage on your baking tray! Bake chicken breasts on a medium-high heat for 25-30 minutes, or until juices run clear. 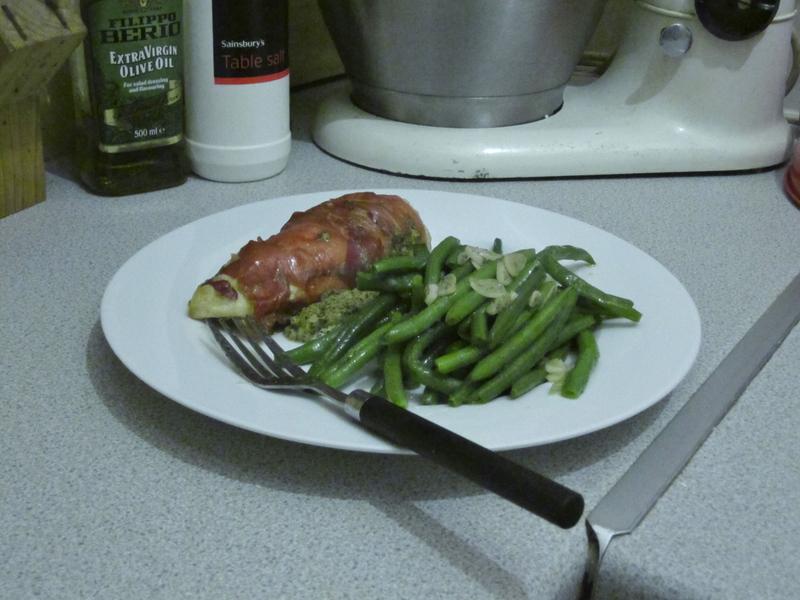 This week I’ve really been struggling to decide on three links to give you… so I’ll cheekily include two in one: The first one tells you all about how Parma ham is made, and the second one is the official Prosciutto di Parma website, which has tons of information and most importantly: great recipes! If you’re not a fan of green beans, here are 30 other sides you could dish up! Finally, if the concept of umami still confuses you, this website has all the info: From what it is, to where you can find it – you’ll never have to go without! Nothing is sadder and less appetizing than a few bits of bread, thinly covered with a bland filling, straight from the supermarket fridge. We all eat sandwiches like that far too often – I say, it’s time for a change! Britain is a nation of sandwiches; there are no two ways about it. And while I love a good, decadently filled homemade sandwich that has fresh veg and fillings poking out at the side, I dislike nothing more than those awful, cold and soggy sandwiches you get with your ‘meal deal’. Who wants to look forward to that? No wonder people can’t find the joy in cooking and eating if all they live on tastes, well… horrible. I haven’t made many videos that work well as lunch, because I often told myself that people wouldn’t have time for that in the morning. I’m one of the laziest people you’ll ever meet and no matter how much I enjoy cooking, I don’t want to wake up half an hour earlier every day just to spend it on the stove. But this term I find myself eating at university a lot, and since I prefer preparing my own food instead of paying over the odds for something substandard, I always take a packed lunch with me. The great thing about these two recipes here is that they work wonderfully in single servings, taste delicious and they are so quick to prepare. I bet any of you that you could make either of these dishes in six minutes or less. I’m not even joking. These are only two of many recipes that can be re-arranged, re-developed or invented from scratch that work great for lunch. If you have a day off, treat yourself to a warm lunch, or if your work has a microwave, even better. The tuna and broccoli noodles are quickly becoming a favourite dish of mine, and the couscous salad is easy to transport, superquick and supereasy to make. But whatever you want to take with you, do invest in a good lunch box. Don’t do it like me, you’ll have tuna leaking all over your bag and you’ll be smelling it for weeks! Although I must say, I do enjoy the company of the cats I’m attracting. Fed up with the usual sandwiches? Me too, and so is Hugh! Follow this link for a great guide on how to make lunch tasty, everyday. If you’re unsure about where you can get responsibly sourced fish, here is a list of Supermarkets and their involvement in sustainable fishing. If you have leftover couscous may I suggest making it into a tasty quiche? This recipe looks so fantastic, I might just have to try it myself! Antonia Landi for the Useful Times. This week, I’ve decided to make myself sound like a bit of a hypocrite and declare bread to be ‘better than toast’. Well, let’s just put it this way: All bread can be good toast but not all toast is necessarily good bread. In fact, once you’ve baked your own I’m convinced that little else will satisfy you just as much. Bread is such a basic thing that we rarely stop to think about it. Supermarket bread is readily available at any time of the day and stays soft for days, but rarely sports a great crust. Of course, you could go to an artisan baker, but I’m somehow reluctant to pay a fiver for a loaf that I could just as well make at home. And yet, baking bread doesn’t really catch on with the younger generation. I don’t know if it’s because it’s seen as something old-fashioned to do, or if people are put off by how long the whole process takes. Granted, it’s much quicker to go to your nearest store and buy some than make your own, but homemade bread ages far better and gives you endless possibilities. Besides, you could make your whole flat smell of freshly baked bread and snack on a warm loaf afterwards. What’s not to love? There are no two ways about it: making bread does take time. But that doesn’t mean that this is a bad thing! Schedule your bread-making on a day you have lots of little things to do, that way you can cross things off your list while you wait for the bread to rise. Make the dough and then tidy your flat, knock the bread back and skype with your parents afterwards, stick it in the oven and do your nails while you wait. If you’ve never baked bread before I would really urge you to take your time with this recipe. Get a real feel for the dough, see how it changes beneath your hands while you are kneading it. After all, breadmaking is an ancient tradition and so vital. Take your time and think about what you are doing; you’re effectively transforming three basic ingredients (water, flour, yeast) into food with only your hands and some heat. You can probably already tell, but I really find something almost magical in making bread. It is needless to tell you just how many different kinds of bread you could make. Wholemeal, with seeds, sweet, savoury, you can play around with different flours like spelt and rye, make a tin loaf one day and then burger buns the next – I could go on forever. Take this very basic recipe, memorize it forever, and run with it. Quite honestly, the best advice about breadmaking I can give you. 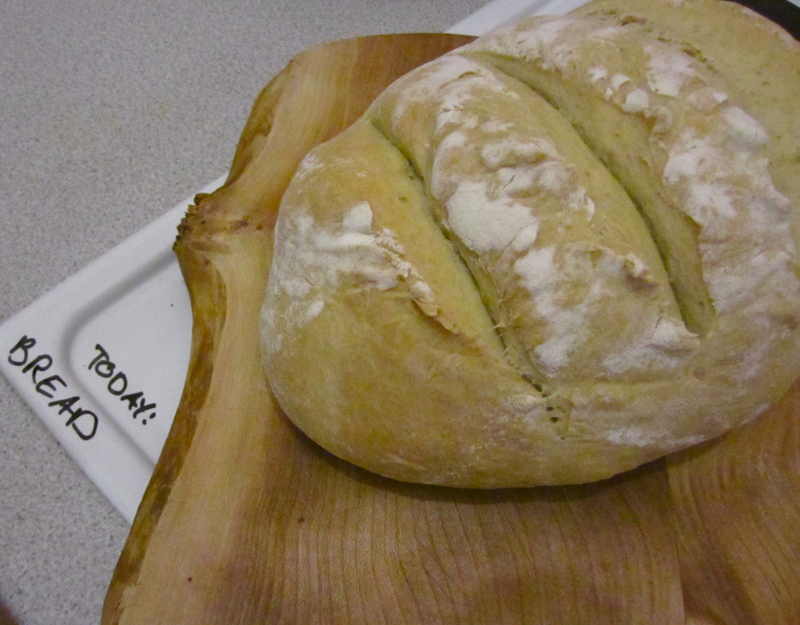 Want to know more about baking your own loaved? Check out this website for a thorough bread baking 101. Once you’ve made your loaf you can either eat it as it is or make it into this heavenly creation (hint: goes down great at parties!). And finally, don’t ever get tempted to throw out hard bread. There’s still plenty of life in it! There really isn’t much to say about today’s recipe, apart from that it’s quick, easy, and just delicious! Fried rice is one of those treats that we all indulge in, but rarely think to do ourselves. A staple in any Asian restaurant and take away, fried rice is a very British way of having Chinese. It’s just foreign enough to tickle our taste buds with unusual flavours, but it’s still made up of ingredients that we know and love. Today’s fried rice is supposed to be served as a main dish, but it can very easily be transformed into a side by halving the amounts. If you’d prefer a more substantial meal, try adding some ham to the dish. And if you’d like to be a bit more fancy, I’ve got just the recipe for you! Just have a look at the links at the bottom of the article. 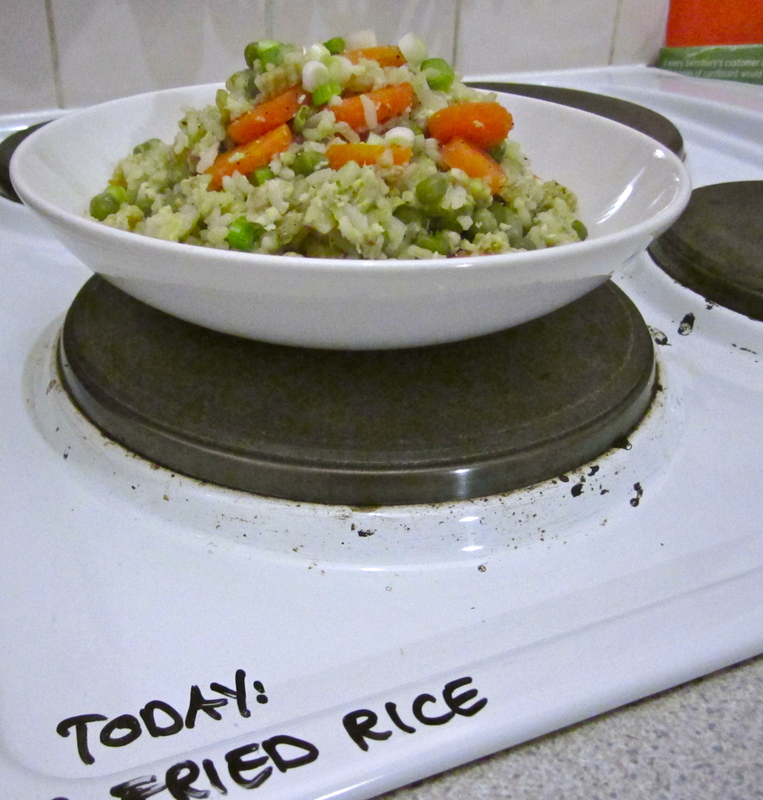 I often used to make egg fried rice with simple vegetable oil – it’s cheap and it works. But if you really want to take your dish that little bit further, do invest in a nice bottle of sesame oil. There are two kinds of sesame oil out there: light and dark. Dark sesame oil is made out of toasted sesame seeds and has a stronger and more complex flavour. Both work wonderfully with today’s dish, just keep in mind to use less oil if you choose the dark one, as you don’t want it to be overpowering. If you feel like it, try seasoning the dish with a dash of soy sauce. Last but not least all I can tell you is to run with it. There are so many things that you can add to a simple egg fried rice to make it as complex or as simple as you like, from a grown up seafood version to a very simple side of fried rice with spring onions. Think of your favourite ingredients and then make them work together. You’d be surprised at how quickly you can invent new recipes! Nobody I’ve met has ever really been sure of how to properly cook rice. There are so many methods I won’t even get involved in it! If you are looking to achieve heavenly fluffy rice, follow this link. Feeling fancy? Here is a great Thai version of fried rice, just begging to be teamed up with a glass of chilled white wine. By far one of the most useful websites on the internet, Love Food Hate Waste has great tips on what to do with leftovers and how to make food go further. I’m back and I can’t wait to get stuck in. Prepare yourselves for some delicious cooking coming your way, because I’ve got great things lined up for you! After a lengthy winter break due to a minor injury I’m finally back doing videos. Having a break every so often is really good, as it gives you time to reflect on what you’ve achieved so far and also gives you the opportunity to plan ahead. And boy do I have some ideas! First of all I’d like to introduce you to TVP. If you are vegan or vegetarian you probably already know what I’m talking about. TVP is short for textured vegetable protein and comes in little granules as well as bigger chunks. It is an ideal substitute for mince and has so many advantages over meat. It’s cheap – especially if you buy it in bulk, it lasts forever, it’s low in calories, and it looks and tastes great. There’s really nothing TVP can’t do. One of the reasons I’ve decided to make this video is because it’s January and most of us are dieting, or feel like we should. 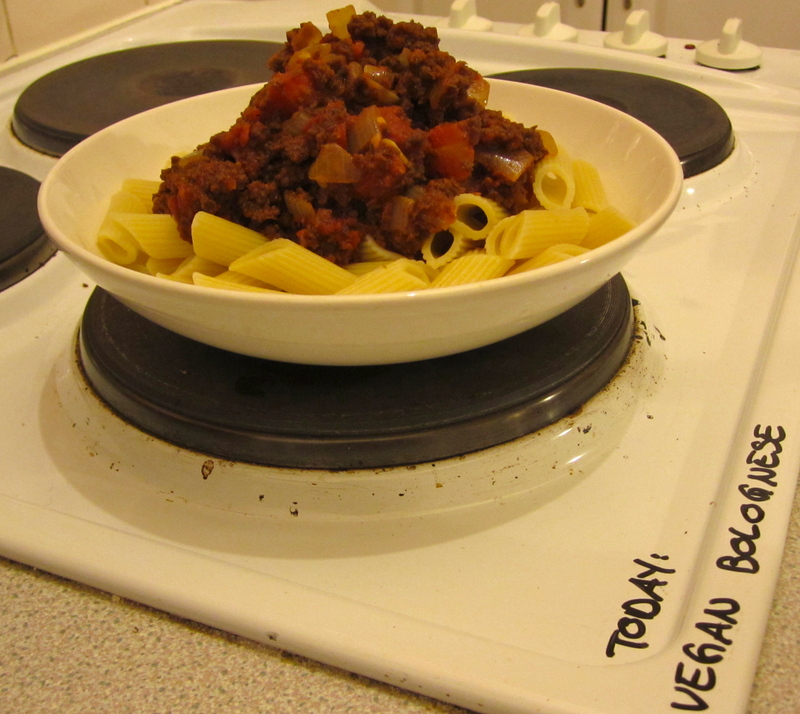 To compare: one serving of TVP has 125 calories, compared to the 350 calories of 200g extra lean beef mince. You can see where I’m going with this. Nowadays you can find TVP pretty much everywhere; check your local supermarket (it usually likes hang out with the stuffing mix…) or health food store. Health food stores will usually have TVP for cheaper and carry two kinds: light and dark TVP. There is absolutely no difference between them, except that the dark TVP has been coloured with caramel to make it look even more like mince. Honestly, once it’s on a plate, you really can’t tell the difference. I must warn you now, since I’ve just recently gotten 15kg of the stuff there’s a good chance I will be cooking with it every now and then but don’t worry, if TVP is just not for you, simply replace it with some mince and follow the recipe as usual. And for the icing on the cake, or if you are indeed cooking for someone who is vegan, simply get some vegan parmesan to complete the dish. For a more thorough explanation of what exactly TVP is click here. If you’ve grown to like TVP and are wondering what else you could use it in, then why not start with a taco? Last but not least here is a list of common veggie/vegan/raw foods and what they are. Very helpful if you feel a bit lost! Fancy snacking on a sweetroll but you’ve had yours stolen yet again? Worry no more! With a few quick and easy steps you can simply make your own! As soon as I saw a sweetroll in Skyrim for the first time I immediately exclaimed ‘That’s a Gugelhupf!’ Since then I’ve been meaning to do this video and now I finally got round to it! A Gugelhupf is a very popular cake that comes from the German-speaking regions (which is where I come from) and comes in sweet as well as savoury varieties. 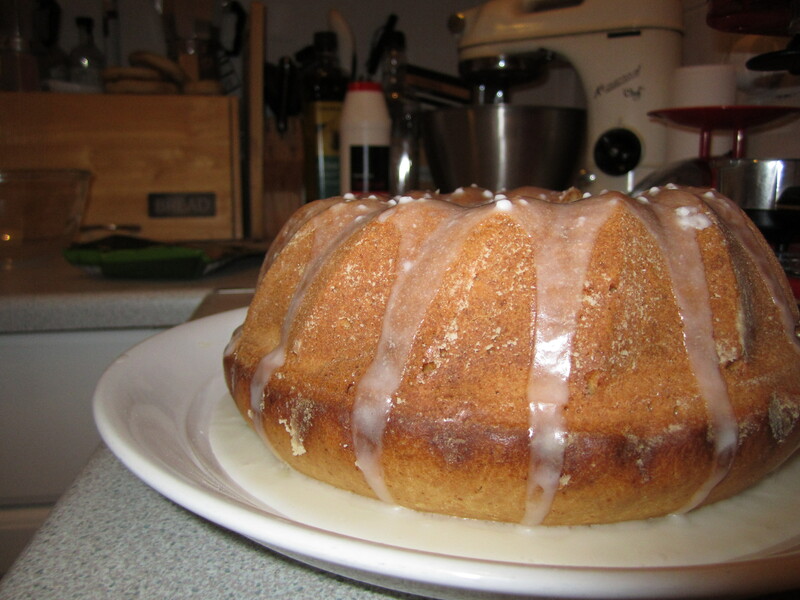 I realised that many people might not know about this cake and would never have the joy of baking their own sweetroll. And that’s just unacceptable! Some tins are bigger/taller than others, so you might need to adjust the recipe accordingly. My tin is fairly large and could have done with a little more dough, so if yours is too, simply use 700g flour, 300g sugar and 300ml milk instead of the quantities mentioned above and you should be fine. Here in the UK Gugelhupf tins are relatively easy to find. I got mine from TK Maxx which usually sells a few different shapes and sizes. If you live in the US a bundt cake tin is fairly similar, although it is not as high as a Gugelhupf and not as elaborate. If you can’t find a suitable tin in any store, go to Amazon! They stock lots of different varieties for little money. Last but not least if you want to read more about where the Gugelhupf comes from and get a lovely recipe for a savoury bacon and onion Gugelhupf click here! Toad in the what? I don’t know, but just stay with me, okay? I promise this dish is so moreish and comforting, you won’t want to eat anything else until March. 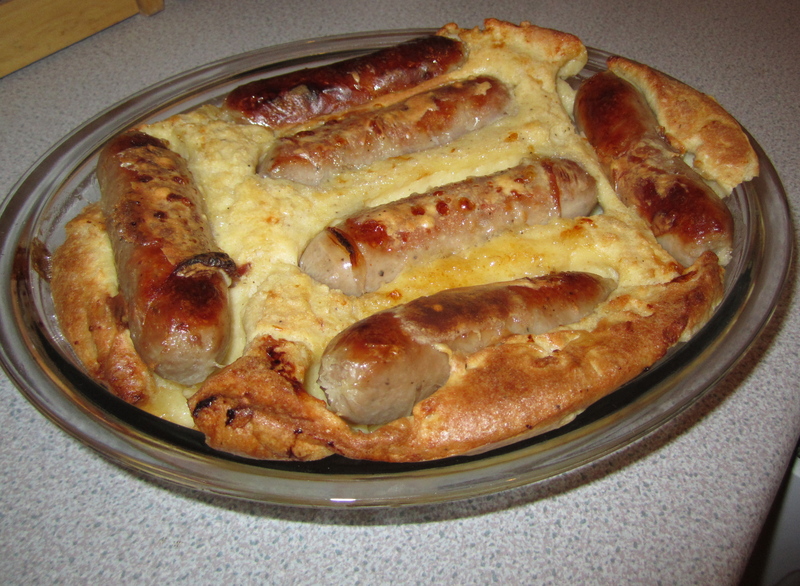 So, for those who don’t know this dish, it’s basically sausages in a giant yorkshire pudding. Doesn’t that sound fantastic? It’s really easy to make and so great during winter. Plus, if you master this one, you’re bascially already an expert on how to make yorkshire puddings, so really it’s two recipes for the price of one! For some reason I always thought that there must be some kind of wizardry going on when making yorkshire puddings. I fell in love with them the moment I set foot in Britain, but couldn’t for the life of me figure out how they make them. Why do they rise so much? What do you mean pour the batter in hot oil? That’s not gonna make any difference… is it? Turns out, it really does make a difference! I have since been told that the yorkshire pudding batter rises so much because of the egg, although my knowledge doesn’t go beyond that. Sausage-wise, it’s easiest to keep it traditional – this is a British dish after all! Use nice plump bangers that’ll stay moist throughout the cooking process, unless you happen to be vegetarian of course! In that case opt for this tip: I’ve never been a big fan of overpriced quorn style veggie sausages – they cost a fortune and more often than not the taste is quite disappointing. So if you don’t mind getting your hands a bit dirty go get some sausage mix – you’ll usually find it in the aisle next to dried stuffing mix. It’s dirt cheap, makes a load of sausages, and you can season and shape them any way you want! I’ve used them in Toad in the hole before, and boy are they tasty. But I am rambling. To get back to the topic: make sure your oil is seriously hot before adding the batter (use vegetable oil, as olive oil starts burning at high temperatures), try not to open the oven once the batter’s in and if your toad is collapsing when you take it out, stick it back in for another few minutes! The trick is to make it get nice and crispy, so that it won’t collapse under its own weight. If you’re having serious trouble with it, try making individual toads in a muffin tray – they are easier to heat up quickly and therefore less prone to disasters. A note on making your own gravy: You really don’t know how easy it is until you make it yourself. I was a firm supporter of instant gravy, and I can still see the benefits of it, but when a dish really makes the gravy shine, it’s definitely worth making your own. There is virtually nothing that can go wrong and it’s just fun and so easy! Besides, nothing can beat that ‘I just made my own gravy’ feeling. Heat oil in oven dish in a preheated oven on a high heat until very hot. Add sausages, reduce heat and bake for 20 minutes or until cooked thoroughly. Add batter and bake on a high heat for 20 minutes or until crispy. Ever wondered how Toad in the hole got ist name? This is by far the best explanation I could find! Almost entirely unrelated to this week’s recipe, I came across this charming website that explains all the British culinary eccentrities to the non-Brits among us. Mainly aimed at those living in the USA, it’s a great read if you want to have a laugh! If you’ve made too much roasted cauliflower (and who can blame you – roasted cauliflower tastes delish!) here is a great recipe for a lovely casserole. 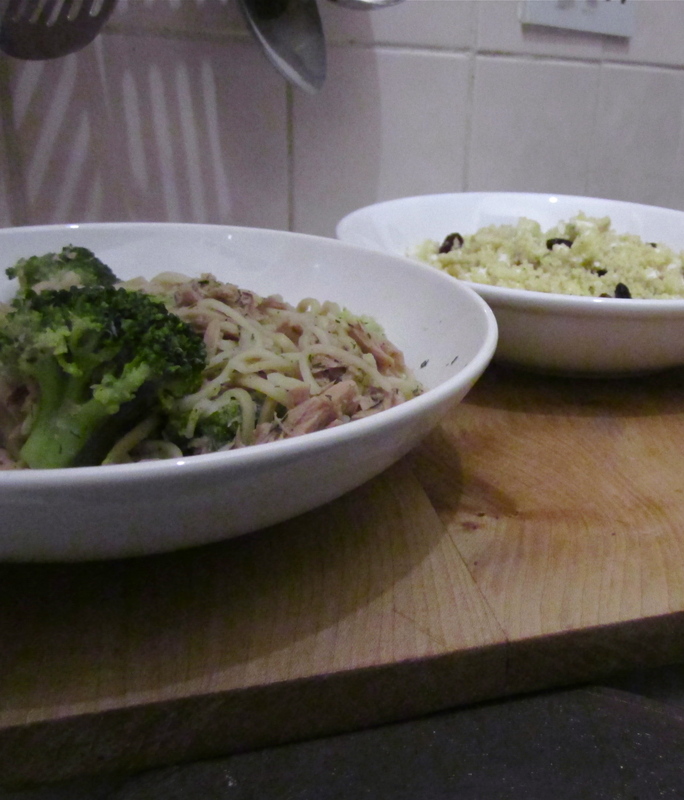 Hailed as the quick and easy midweek supper, risotto actually took me quite a while to perfect. But once you’ve got your technique down, it’ll definitely become a favourite. Making risotto is all about stirring stirring stirring – unlike instant polenta, there is no cheat mode to delightful risotto! I used to find making it really stressful, as I’m usually busy doing three different things at once when I’m cooking – chop while you cook, that kind of thing. I would’ve been really grateful if someone told me at the start that risotto requires your full and undivided attention, so here it goes: Risotto requires your full and undivided attention. That means measuring and chopping and grating all the ingredients before you start, and having them at arm’s reach. As if you were doing a cooking show! This way, you can pay close attention to what is happening inside your pan, which is very important. By stirring the rice frequently, you do not only prevent it from burning to the bottom of your pan, you also release its starchy goodness, which leads to a heavenly creamy risotto. Do make sure you use either Parmiggiano Reggiano or Grana Padano as these cheeses blend into the sauce wonderfully. Mushroom-wise there is not much you could do wrong. Go for wild mushrooms as they have a bigger and more diverse flavour range than the more traditional mushrooms you find in your supermarket. Remember, mushroom season is almost over, so make the most of it while you can! Think girolle, oyster, brown beech, pied bleu – the list goes on and on. If you’re struggling to find any, have a look at dried mushrooms – they keep forever and all you need to do is soak them before cooking! My favourites are girolle, oyster and porcini mushrooms, but there are endless possibilities. If there’s a big Morrison’s supermarket near you, get your mushrooms there. They have the biggest variety of mushrooms I’ve encountered in a supermarket so far, and their labels tell you about the variety’s taste and texture. 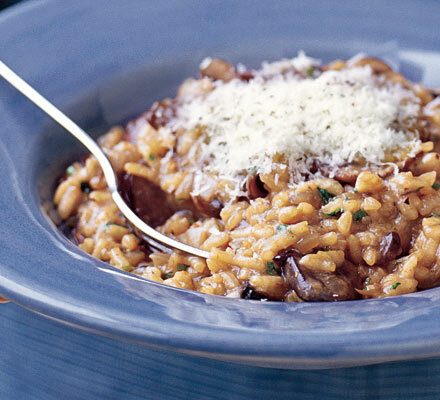 Last but not least don’t attempt cooking a risotto with long grain rice – it won’t work. Have a look at the links below to find out why. Carnaroli is my rice of choice, but Arborio is generally easier to find – I got my rice from asda though, so there’s no need to go to an overpriced deli for it! Just shop around and I’m sure you’ll be able to find what you need. What’s the difference between basmati and Arborio rice? And what about Carnaroli? Does it really make a difference? Find out here why risotto rice is different and get acquainted with 5 different types (yes five!). I’ve never made any kind of stock myself and I don’t really mind admitting that, but I feel like I should at least give you the option to do it yourself. And who knows, maybe with this second version that uses no chicken bones at all and is only supposed to take an hour I might even try it myself! OH NO! I’ve made too much risotto! Yeah right, we all know that you just wanted to have enough leftovers to do these super tasty rice fritters. Ever put ice cream in the oven? No? You should try it, it’s delicious! Now, before you call me mad, I should add that the ice cream is protected by a thick layer of whipped egg whites – that is unless your first attempt fails, just like mine did! The video you are watching is actually the second attempt at this dessert. In my first video, I thought it might be nice to put a layer of jam over the top of the ice cream, so that it would create a nice red rim around the ice cream once you cut into the baked Alaska. What I hadn’t considered is that it caused the egg white to slide away from the ice cream, causing a big rip to appear in my meringue. The heat seeped into the centre of the cake and you can imagine what the end result looked like… Messy, to say the least. But we all make mistakes, and after a night of sulking I simply made another one. Nothing like a bit of cake to cheer yourself up, right? Now, apart from having a freezer full of baked Alaska, I’m actually quite glad that this little disaster took place. If it hadn’t, I probably would’ve never talked to you about what happens when things go wrong in the kitchen! This in itself is such a big topic, that I couldn’t possibly cover it all in one article. I have, however, put some very useful links at the bottom of this page, so do check them out. To make sure that you succeed, take good care when whipping the egg whites. Your bowl and whisk should be absolutely free of any oil – the best way of doing this is running a wedge of lemon across your equipment just before starting. Make sure you separate the eggs correctly – you will be at the mercy of your egg whites, so be really careful not to drop any yolk into it. As a little pointer: it is easiest to separate an egg when it’s cold, but egg whites are best whisked at room temperature. And if things do go wrong in your kitchen, start from the top and remember: this happens to the best of us! If you’re in the kitchen often enough, chances are that at some point you’ve either burnt, broken or over-salted something. While at the time this might seem like the end of the world, do have a look at this website before you bin everything – you might be able to save it after all! For some baked Alaska related info and a lovely recipe for dainty mini versions of this dessert, click this link (and do ignore the apostrophe mistakes…). When making meringue, you can never read up too much about it. From failing to separate eggs to over-whisking, the truth is that a lot can go wrong. But there are great little tricks that prevent you from making these silly mistakes! You can find some of them here. Get new posts directly to your inbox!